This kit uses LM384 audio power amplifiers and contains two identical amplifiers capable of delivering a gain internally fixed at 34 dB with a maximum peak current capability of 1.3A. This kit uses the 14-Pin PDIP to allow a greater max. package dissipation of 5.0W. 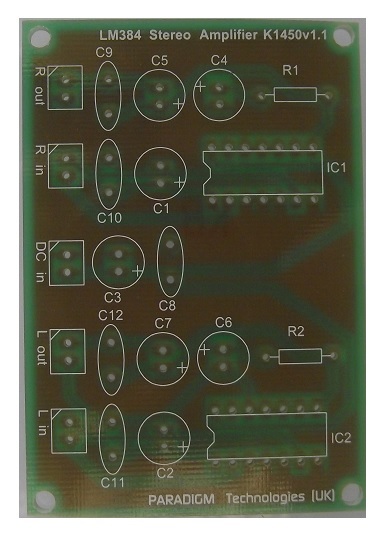 Paradigm Technologies have designed a fully symmetrical PCB around the LM380 chipsets to ensure that maximum performance is obtained. The components used in this kit are high quality passive components and also includes polyester bypass capacitors. Very high quality low ESR electrolytic capacitors, very low temperature coefficient metal film resistors, alongside the thermally stable very high quality bypass capacitors, enables this kit to deliver maximum performance and sound quality.